Da Nang (VNA) - The University of Da Nang in collaboration with Fablab (fabrication laboratory) Da Nang, the United States Agency for International Development (USAID) and Arizona State University (ASU) officially launched a Maker Innovation Space in the central city of Da Nang on August 11. The space, located at Da Nang University, will help students gain skills to launch and test new technologies and innovative solutions for community development challenges with access to a fully equipped laboratory. Maker Spaces enable university students to design, prototype, and manufacture their projects. The Da Nang Maker Innovation Space will be equipped with 3-D printers, laser cutters, a wood and metal shop, as well as advanced design software available to all university student members. Students will be able to use the Maker Innovation Space to translate the Science, Technology, Engineering, and Mathematics theory they learn in the classroom into prototypes for technological solutions for real-world problems. It is not only an educational facility, but also a solutions and inventions laboratory. “The space is the most advanced innovation centre out of all Vietnamese universities and colleges, and we are proud to be the second city in Vietnam developing such a space after HCM City,” said director of Da Nang University, Tran Van Nam. He said the launching of the space was part of progressive efforts made by the University, USAID, ASU and Fablab Da Nang since 2015. “Technology is changing everything we know...countries and people that embrace innovation are in the driver’s seat. 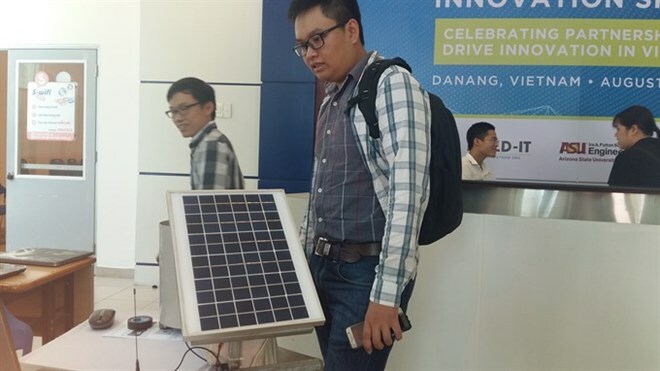 Innovators get to shape these changes,” said USAID Vietnam’s Deputy Mission Director Craig Hart at the launch event. The Maker Innovation Space is a component of the USAID Building University-Industry Learning and Development through Innovation and Technology (BUILD-IT) Alliance, a five-year project funded by USAID and implemented by ASU. The BUILD-IT Alliance is designed to help Vietnam modernize its Science, Technology, Engineering, and Mathematics (STEM) higher education system. With more than 16 high-tech industry partners, 16 university partners, and the support of the Ministry of Education and Training and the Ministry of Industry and Trade, the Alliance is strengthening higher education policy, enabling closer university-private sector collaboration, and modernising Vietnam’s academic programmes in STEM fields. USAID BUILD-IT launched its first Maker Innovation Space in HCM City’s Sai Gon Hi-Tech Park and selected Da Nang for its second facility based on the city’s reputation for innovation and the strength of its partners here. USAID aims to help coming generations of university graduates achieve inclusive, technology-based growth, which fits squarely into Vietnam’s ongoing effort to revolutionise its economy under the Vietnam 2035 strategy. Earlier this year, Da Nang University and University of Nice Sophia Antipolis and the Agence Universitaire de la Francophonie (AUF) (Francophone University Association) inked a Memorandum of Understanding (MoU) in the fields of scientific research, education and student exchange, technology transfer, communications, business management, water management, and embedded software systems. The university also plans to establish a teacher training college for engineering and the Vietnam-United Kingdom University in the central city from next year.